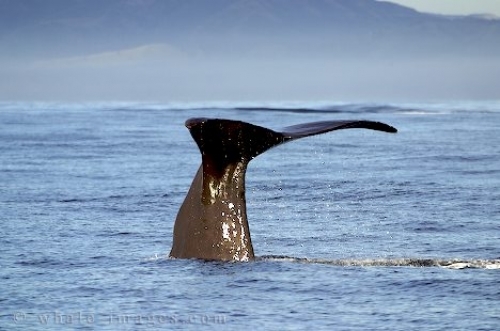 Whale Tail Pics - Physeter Macrocephalus, Kaikoura, New Zealand coast. Momentarily standing upright like the top of a submarine, before plunging below the water line. I captured these sperm whale tail pics, on a beautiful sunny day on the Kaikoura coast of New Zealand. The sun is reflecting off the whales skin and the water is dripping off the gigantic tail in small streams. It was as though he slowed long enough for me to get some whale tail pics. Picture of a Sperm Whale tail.